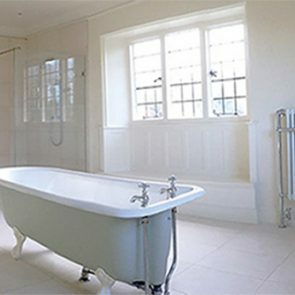 We’re particularly proud of this plumbing and heating renovation project we undertook for a substantial house on the outskirts of Lymington. We project managed the full installation of 9 bedrooms and 9 bathrooms, en-suites and cloakrooms with all heating and hot water controlled via remote access thermostats. This smart technology meant that all central heating and hot water for the entire house could be controlled from anywhere in the world. Controlled via an iPhone, Android or Windows Phone by simply downloading the app to the device of choice.